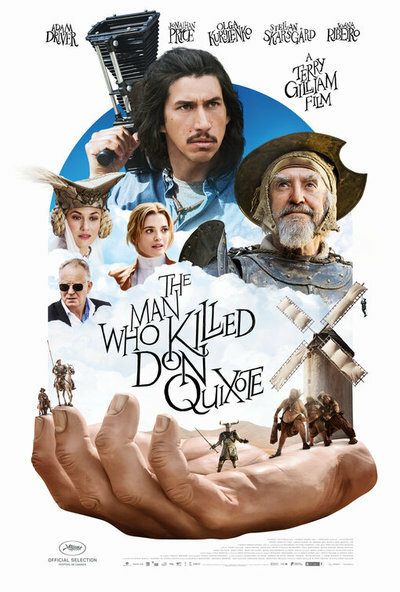 Witty, goofy, and glorious, “The Man Who Killed Don Quixote” is Terry Gilliam’s best film in two decades. Yes, the critical accusations after its Cannes premiere that it’s messy are 100% right, but it’s a beautiful mess, the kind of passionate, creative filmmaking that the director made back in the ‘80s and ‘90s. After several films in which the mess overwhelmed him, it’s wonderful to see Gilliam able to finally realize the vision that eluded him for a quarter-century in such a complete and satisfying way. “The Man Who Killed Don Quixote” has been in production for so long that Gilliam has gone from the young character of Toby in his film to the man who believes he is Don Quixote himself, unwilling to give up on his imaginative dreams. It is a film that only Terry Gilliam could have made, and nothing was going to stop him from doing so. If you’re not familiar with one of the most remarkable stories of development hell in the history of film, Gilliam started working on this film in 1989, although he didn’t secure funding until 1998, and he started actually filming not long after with Jean Rochefort and Johnny Depp in the lead roles. What was intended as a making-of doc that you would see as a DVD special feature turned into a fascinating behind-the-scenes full-length film called "Lost in La Mancha," released in 2002. It appeared then that “Don Quixote” was dead, but Gilliam kept trying to get it off the ground in the ‘00s and ‘10s, with names like Ewan McGregor and John Hurt attached. Finally in 2017, Adam Driver helped secure financing, agreed to star, and “Brazil” star Jonathan Pryce reunited with Gilliam for the other leading role. It was finally going to happen. Inspired by the Miguel de Cervantes character, "The Man Who Killed Don Quixote" uses that iconic role to tell a story of art, betrayal, and possible insanity. Driver plays a director named Toby Grisoni, who is in Spain when he stumbles upon a DVD of a student film he made there a decade ago about Don Quixote. He tracks down the two key players from that short—an old man named Javier (Pryce) and a young woman named Angelica (Joana Ribeiro). Toby discovers that Javier, a villager that the young student found and cast, has now convinced himself that he is Don Quixote, and Javier immediately presumes that this familiar face of Toby’s means that Toby is his Sancho Panza. While Toby fights it, the two head off on a journey that blends fantasy and reality in a way that only Gilliam can. The narrative isn’t that different from “The Fisher King," in the way that film also played with fantasy elements and presented us with a character with an arguably loose grip on reality. However, Gilliam’s script (co-written by Tony Grisoni yes, one letter different from our protagonist) is itself a commentary on a filmmaker returning to the scene of his cinematic past. How Toby used and arguably broke Javier and Angelica years earlier is clearly in some ways the product of a filmmaker coming to terms with his own behavior and career. In a sense, there’s a bit of both Toby and Javier in Gilliam—the cynical filmmaker and the wide-eyed dreamer. It’s almost like watching a man deal with the two halves of his personality through storytelling. And he could not have found two men more completely willing to realize his vision than Pryce and Driver. We can only imagine what people like Depp, Rochefort, and Hurt would have done here, but it’s hard to believe they would have been better. Both men give Gilliam their all, submitting to his cinematic flight of fancy in every way. Driver turns a part that could have been a wide-eyed observer into a charismatic leading man and Pryce finds just the right balance between melancholy and whimsy. Think of what these two performances could have been and you’ll realize how perfectly modulated they are by Driver and Pryce. So what does it all mean? After three decades of trying to get the same movie made, what have we learned? As cheesy as it sounds, Gilliam believes that the world needs Don Quixotes. It needs people with vivid imaginations and unshakeable moral cores. Gilliam has made a number of films about how fantasy can impact and even illuminate emotional truth. Thank God he’s still out there, tilting at windmills for all of us.